Some weeks ago we discussed the Samoan "small canoe," or paopao, drawing from the work of Te Rangi Hiroa. In contrast to the paopao, which was paddle-propelled and used only on calm waters, the larger 'iatolima was sail-propelled and meant for use outside the reefs. Both were outrigger dugout canoes, with the outrigger on the port side. Hiroa could not find any 'iatolimas for direct observation, and it is possible that none remained in use at the time of his research. 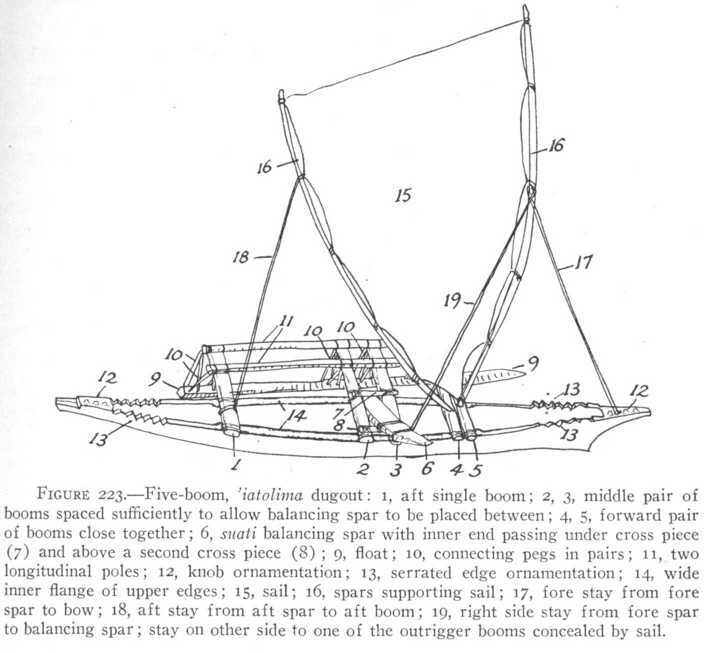 The image above depicts a model of a boat that combines the hull of a soatau with the rig of an 'iatolima, and that seems to be the best we have to go by. The soatau was very much like the paopao, even down to the carved decorative elements, only somewhat larger. The 'iatolima hull, in contrast to this, was broader in the ends and would have had "topsides" or "bow and stern covers" (Hiroa's terms, i.e., partial decks) to protect it from boarding waves. The 'iatolima rig, however, is believed to appear intact in the sketch of the model. It is unusual in having five outrigger booms, when most boats of this size would make do with two or three. ('iatolima translates as "five booms.") But the extra booms are put to good use. The two forward booms (#4 and #5 in the illustration) are very close together, serving as a mast step. The two booms amidship brace and support the balancing beam, a broad plank on which the sailor could hike out to starboard in order to counterbalance the boat's heel to port. The aft-most boom needs no explanation. The outrigger float is cut off short immediately behind the aft boom connection, as on the paopao. Two longitudinal timbers are lashed to the booms directly above the float. While this would have stiffened the ends of the booms somewhat, that hardly seems necessary, given the width and number of the booms. I suspect they mainly served as another hiking platform, for use when sailing on a port tack. The rig is, in most respects, a standard oceanic sprit of an upright posture. Stepped far forward, it is a tacking, not a shunting, rig. It is stayed to an unusual degree, with a forestay and shrouds on both sides of the "mast." 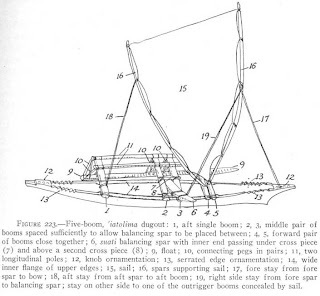 Also shown (#18 in the illustration) is an "aft stay from aft spar to aft boom" but I believe this is an incorrect interpretation. Such a stay would immobilize the sprit and prevent tacking. I think that this line is really the main sheet, tied down to the aft outrigger boom in the model simply to avoid it hanging loose, as it probably would have been when sailing.